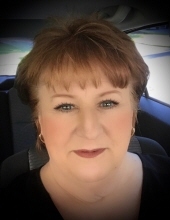 Nancy Kemp Manzie, 60, of Chesapeake, went to be with the Lord, peacefully on Saturday, February 9, 2019. Born in Norfolk, she was the daughter of the late John David Kemp and Jacqueline Kay Kemp. Nancy worked for Sentara, Managed Care Division, as a Managed Care Contracting Assistant. She attended River Oak Church, Chesapeake. Survivors include her daughter, Kylie Elizabeth Manzie and a significant other, Hunter Patrick Davenport; a grandson, Rylan Teigen Davenport; a sister, Cindy Samford and husband Mark; a nephew, Ethan Samford and wife Lauren; a niece, Erin Samford; a great-nephew, Blane Samford, as well as other beloved family. Nancy’s life will be celebrated at 11:00a.m., Thursday, February 14, 2019 at Oman Funeral Home & Crematory, Chesapeake. Pastor Heath Burris will officiate. The family will receive friends following the service. Memorial contributions may be made to River Oak Church, 255 Great Bridge Blvd., Chesapeake, VA 23320. To send flowers or a remembrance gift to the family of Nancy Kemp Manzie, please visit our Tribute Store. "Email Address" would like to share the life celebration of Nancy Kemp Manzie. Click on the "link" to go to share a favorite memory or leave a condolence message for the family.